The Way I See It: It's Easter Peeps! Andrea, good candy taste must run in the family - Drostes, Peeps and baci are three of my favorites! Peeps are best when stale, don't you think? I rip the package open 2 weeks early for optimal stale-ness. maybe stale is the way to go, cuz fresh is just too sweet for me. did you see cbs sunday morning today? Sisters think alike! I do open the package and let them harden, also great frozen. Sue- No, what did I miss? A Peepfest. I hope it wasn't something bad, like Petm- Prevention and Ethical treatment for marshmallows. it was more peep art. you'd a loved the peep all dressed up to look like a pharoah. (i think it was a rerun.) have you ever blown up peeps in a microwave? For peep sakes that was so creative! 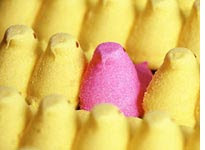 I have to say I like peeps if they are a little hard, but those orange creme peep eggs I like fresh! I would have to say any type of chocolate is good to me! I love hazelnuts in the chocolate too! YUMMY! Happy Easter! Me, I'm mostly about chocolate eggs and white rabbits this time of the year. What happened to the old header? I don't know when you've changed it, because I've been reading you on Google reader, lazy me. I like them both, even though the sight of the corsets make me hyperventilate (restrictive underwear phobia I think). I am addicted to Project Runway (although I am always disappointed with their ultimate choices).. That was hilarious! Have you ever tasted the Swiss Cote d'Or chocolates?! mmmmmmmm yum! You made it work, I was wowed. I had two peeps today. Yellow ones. Marie likes them. Have you seen the new Peeps Cookbook? Genius! I remember Droste chocolate, of course, from wait back when I was a little girl, preferring the dark chocolate the best and liking the shape of them. I think I have had Peeps, because I seem to remember the taste of them, but I am not sure. I would love to try some now. I have such a longing for chocolate and sweets now. I must find some! Where oh where do I find them? You sure know how to make a person develop a craving!